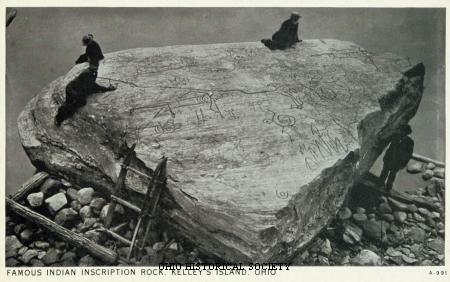 Postcard view of Inscription Rock, on the shoreline of Kelly's Island, Erie County, Ohio, ca. 1915-1935. There was once another boulder with petroglyphs along the north shore of Kelleys Island, but workers quarrying the limestone blasted it apart with dynamite in the mid-nineteenth century. They always peel a large Piece of Bark from some great Tree; they commonly choose an Oak, as most lasting; upon the smooth Side of this Wood they, with their red Paint, draw one or more Canoes, going from Home, with the Number of Men in them paddling, which go upon the Expedition; and some Animal, as a Deer or Fox, an Emblem of the Nation against which the Expedition is designed, is painted at the Head of the Canoes . . . These Trees are the Annals . . . of the Five Nations . . . and by them . . . they preserve the History of their great Achievements. It is likely that Ohio's American Indians also carved or painted important symbols on trees, bark, leather, fabric, and other perishable materials. Most of this ancient art has vanished. The petroglyphs we see today are only the tip of an artistic iceberg.